The first edition, from 1902. As today is the the feast of St. Nicholas (or Sinterklaas, if you are of the Dutch persuasion), I thought it only right and proper to make today's story one about Santa Claus. You may have heard all sorts of strange stories about Greek bishops from Turkey and showing up at the council of Nicea and handing out gifts to people in secret. That is one version, but not the one we are dealing with here. This Santa Claus is a human child, abandoned by his parents, who gets an unexpectedly good start in life by being raised by a Nymph in a magical forest. Nature peopled it in the beginning with Fairies, Knooks, Ryls and Nymphs. As long as the Forest stands it will be a home, a refuge and a playground to these sweet immortals, who revel undisturbed in its depths. While this mood lay heavy upon pretty Necile it chanced that the great Ak visited the Forest of Burze and allowed the wood-nymphs -- as was their wont -- to lie at his feet and listen to the words of wisdom that fell from his lips. He mentions the child, and she runs off to find it. The child grows up in the forest, surrounded by immortals and animals that do not harm him. It is all very idyllic, and the years pass and the boy grows older. At which point Ak tells him to accompany him to have a look at how the rest of humanity lives. He is surprised by what he finds. 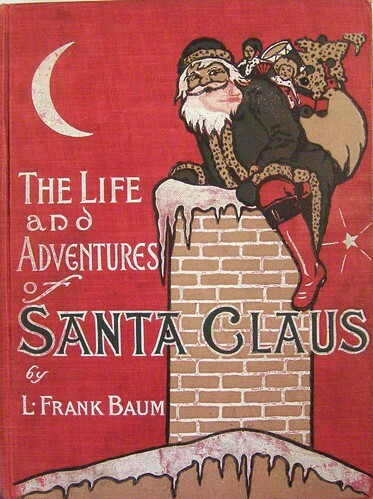 From this you might think Baum's book is quite radical: a story of Santa Claus as a socialist propaganda piece, arguing that we must have equality in order to create equal opportunities. I'm afraid that is not the case. Or if so, it is a weird kind of consumerist socialism (you'll see), which this quote also suggests by making it sound like some children are poor only because their parents neglect to clothe them in silk. Having seen the plight of humans (and in particular their children), Claus feels that he can no longer spend his life lolling about in the Forest. "I have looked upon man, finding him doomed to live for a brief space upon earth, to toil for the things he needs, to fade into old age, and then to pass away as the leaves in autumn. Yet every man has a mission, which is to leave the world better, in some way, than he found it. I am of the race of men, and man's lot is my lot." And so he settles down to loll about in the Laughing Valley of Hohaho, instead. Here, he is an all round nice sort of chap, until he accidentally makes a toy (a carved cat). Then everything spirals out of control. He discovers toys make children happy, and a plan forms. "whether it be rich or poor, a child's longings for pretty playthings are but natural. Rich Bessie's heart may suffer as much grief as poor Mayrie's; she can be just as lonely and discontented, and just as gay and happy." And so he invents dolls. And poor and rich children are equal at last. Toys, in this rather sentimental book, really are the solution to everything. It can defeat even the evil spirits, called Awgwas. They possessed no conscience whatever and delighted only in evil deeds. Classic villains in other words. If you have been going around thinking that money can't buy you love, you are clearly in error: You just have to covert them to toys first. I am sure this coheres entirely with our general experience of how harmonious children are once there are toys for them to own. There is a dramatic interlude in which the Awgwas try to return things to the way they were and are consequently made extinct, leaving Santa Claus to continue his worth with even greater zest. A couple of deer suggest he build a sledge, and they make a night-time excursion to deliver more presents (it must happen at night, mainly because of a difficult gnome). Surprised and dismayed to find that humans tend to sleep at night, Santa is again helped by a deer, who this times suggests covert entry by chimney as a way of (breaking and) entering. He fast becomes a legend, and gains the title "Santa" (because of his way of mysteriously entering locked houses), which comes with certain expectations. But Santa Claus himself would not have approved this speech. He brought toys to the children because they were little and helpless, and because he loved them. He knew that the best of children were sometimes naughty, and that the naughty ones were often good. It is the way with children, the world over, and he would not have changed their natures had he had the power to do so. Nothing must stand in the way of the equal distribution of toys to everyone everywhere. Because toys = happiness. He is only allowed to borrow the deer once a year (Christmas Eve), however; and he must always return them to the forest by daybreak (hence only visiting at night). The upside to this is that he can spend the rest of the year making toys. When another Christmas Eve drew near there was a monster load of beautiful gifts for the children. Things change over the years. Children get their feet wet playing in the snow, hang their stockings to dry by the fireplace; and as Santa Claus is always in a dreadful hurry, he is pathetically thankful and stuffs them full of presents. The word spreads. He also gets some fairies to get exotic fruits like oranges and bananas from the tropics, and candies and bonbons from the Valleys of Phunnyland, all of which he adds to the stockings. Likewise, there are technical developments: He has cleverly put wheels inside the runners of the sledge, so he can also visit children where there is no snow (A great comfort even here in the North, what with global warming and all). And for good measure he invents the Christmas tree. But Santa Claus was born mortal, and he ages as a mortal and grows old. His hair grows white, his face wrinkled, and one year he stays in bed rather than make presents. Faced with the prospect of no Santa, the immortals all band together to grant him the Mantle of Immortality (and before you get any ideas, there is only one in the whole world), thereby ensuring that he will be bringing toys to children for all eternity. Nothing stands in the way of his monomania at this point. "I will make all loving parents my deputies!" cried the jolly old fellow, "and they shall help me to my work. For in this way I shall save many precious minutes and few children need be neglected for lack of time to visit them." Besides carrying around the big packs in his swift-flying sledge old Santa began to send great heaps of toys to the toy-shops, so that if parents wanted larger supplies for their children they could easily get them. A perceptive reader may have noticed a twinge or two of sarcastic cynicism today. This particular kind of Victoriana does that to me. I'm sorry (not really). Denne høres jo på noen måter veldig morsom ut, med god anledning til kritisk refleksjon over teksten og denslags. Anbefaler du å lese den? Nei, ikke egentlig. Eller, ikke hvis man skal ta til etterretning dine matematiske anslag om at vi bare har omtrent 3000 bøker igjen å lese.